We’ve reached the finale of the breakdown of my metric, “Actual Opportunity,” the introduction to which you can find here. I highly suggest reading this before delving any deeper here. You can also find my writeup on running backs and wide receivers. In this article, I will be taking an in-depth look at the tight end position through the lens of this metric and analyzing what this means for the 2018 fantasy season. This was another fairly disappointing year for tight ends. Tight ends scored a combined 6,017 fantasy points in 2017 – their lowest output since 2010. I expect that number to rebound in 2018 with, hopefully, Greg Olsen, Tyler Eifert, and Jordan Reed back to full health. There were also three tight ends selected in the first-round of the 2017 NFL Draft which was tied for the most in NFL history. Considering fantasy tight ends tend to make a significant statistical leap in their sophomore seasons, this too could help restore the position to prior heights. My preferred strategy this season has been grabbing one of Rob Gronkowski, Zach Ertz, Olsen, or Reed in the earlier rounds, or waiting quite a long time to grab two of the lesser-tier tight ends (Charles Clay, Vance McDonald, Ricky Seals-Jones, or Benjamin Watson) in the later rounds. See below for a list of the tight ends who ranked top-20 from an Actual Opportunity (expected fantasy points) per-game basis. Notes: Players needed six games to qualify. All references to Actual Opportunity and fantasy points are in terms of PPR scoring. After ranking eighth, 12th, and 19th in expected fantasy points per game, Kelce catapulted to the top of our list in 2018. He set new career highs in targets per game (7.8), expected touchdowns (5.8), and deep targets (17, matching his prior career total), which should help explain the jump in expected fantasy points. In terms of actual fantasy points per game, Kelce also led the position and would have ranked 10th among wide receivers. Unfortunately for Kelce, the team parted ways with Alex Smith, who is the only quarterback this past decade (of 42 qualifying) to target tight ends on at least 25 percent of his throws. Patrick Mahomes, meanwhile, never once targeted the tight end position in college (Texas Tech’s Air Raid offense). The team also made Sammy Watkins the fifth-highest-paid wide receiver in the league this offseason and has promised more receiving work for Kareem Hunt. Andy Reid’s history suggests at least one of Kelce, Watkins, or Tyreek Hill is currently overvalued by ADP. That’s the bad news. The good news is, Kelce is historically awesome. 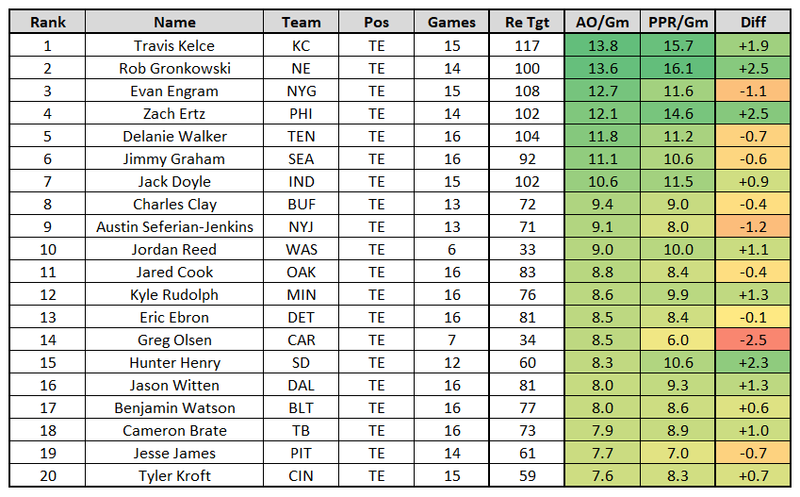 Among tight ends with at least 30 games over the past four seasons, Kelce ranks behind only Gronkowski in fantasy points per game over expectation (+2.2). He also leads all tight ends in missed tackles forced and yards after contact over the past two seasons. I’m still taking Kelce as my No. 2 tight end in drafts, despite these concerns and the lack of elite volume in prior seasons but there’s a sizeable gap between him and the next player on our list. Gronkowski is a legend and an absolute freak of nature. By my data, he is the most efficient fantasy player of the past decade, averaging 3.75 more fantasy points per game than his expectation across his career. He’s also been the league’s most efficient receiver at scoring touchdowns, scoring 25.4 more touchdowns than expected over this span. Since targets became a stat in 1992, Gronkowski ranks first in yards-per-target average (9.94) among all 432 receivers (not just tight ends) with at least 300 targets. Gronkowski also sports a passer rating of 132.4 when targeted, which leads all 320 receivers to see at least 150 targets this past decade. 13.0 expected fantasy points would have ranked third-best last season, and Gronkowski has averaged between 13.0 and 16.2 expected fantasy points per game in six of seven career seasons. Absurdly, he’s also ranked top-three in fantasy points per game over expectation (among all tight ends with at least 35 targets in a season) in six of seven career seasons. If not for a zero-target decoy game in Week 17, Gronkowski would have led the position in both actual and expected fantasy points per game last year. He’s the best bet to lead all tight ends in those categories next season as well. Ertz ranked fourth in expected fantasy points per game after ranking third and sixth in the two seasons previous. In all three seasons he’s averaged between 12.0 and 12.6 expected fantasy points per game. The difference this season was improved efficiency – after posting a (slightly) negative differential in each of the previous two seasons, Ertz tied Gronkowski for the most fantasy points per game over expectation (2.5) last year. Although this might imply an impending regression, and we should be expecting as much from the passing game as a whole, I still feel comfortable taking Ertz as my No. 3 overall tight end. Ertz did benefit from improved efficiency from the entirety of the offense, but he also played much better in 2018, grading out fourth-best in PFF receiving grade after ranking 18th and 10th in the two seasons prior. He’s also the only tight end to rank top-six in expected fantasy points per game in each of the past three seasons. Seattle’s running backs totaled just one rushing touchdown all season and Graham benefited serving as the de-facto goal-line option. He was targeted 14 times inside the 5-yard line last year, which is the most by any player this past decade. In fact, he totaled more targets inside the 5- and 10-yard lines last year than Kelce has throughout his entire career. For perspective, Green Bay’s tight ends have averaged just four targets inside the 5-yard line per season. He led the position in both touchdowns (10) and expected touchdowns (10.1) but was fairly useless outside of this. 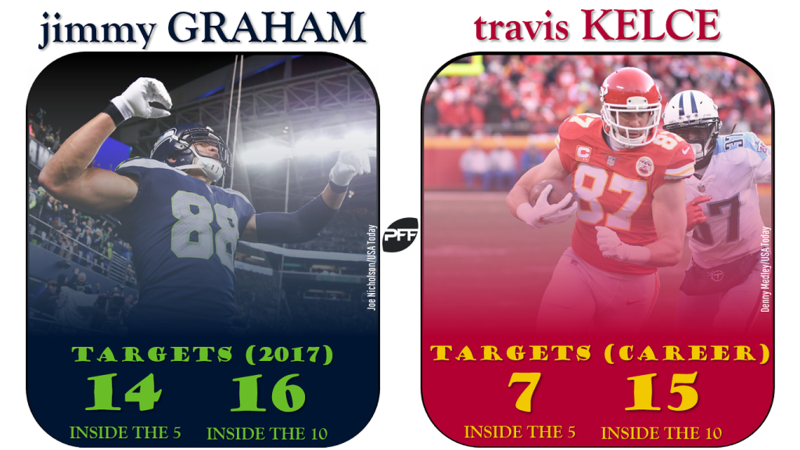 Graham averaged just 5.42 yards per target last season, which ranks fifth-worst among 167 qualifying tight ends this past decade. He totaled 178.1 expected fantasy points last season, which is a number that has never been reached by a Green Bay tight end since Aaron Rodgers became the starter. Only once over the past five seasons has a Green Bay tight end posted top-25 numbers at the position, which makes Graham far too risky at his current ADP (TE4). On top of Green Bay seeming to be an unideal landing spot, anytime a tight end changes teams, that, in and of itself, is also a concern. As I illustrated here, among all 15 tight ends (since 2010) who changed teams and still ranked top-24 in ADP that year, none would go on to beat their ADP. In 2016, Olsen led all tight ends in expected fantasy points per game (13.9). In 2017, he averaged a lowly 8.5 after averaging 13.1 over the prior three seasons. This was a big falloff for him but was also almost entirely due to injuries. Olsen suffered a fractured foot in Week 2, was eased back into playing time when returning, and then averaged 14.0 expected fantasy points per game over the final three weeks of the season. There’s a new offensive coordinator in Carolina, but I doubt Norv Turner’s arrival will have a negative consequence for Olsen. Among all seasons as a head coach or offensive coordinator this past decade, Turner’s TE1s average 10.7 expected fantasy points per game, which ranks behind only Doug Pederson among active playcallers. Given Olsen’s long history of elite production (top-seven among tight ends in fantasy points in each of the prior five seasons) and volume, I’m willing to write off his 2017 season as an injury-fueled outlier. He’s a fine value at ADP (TE5). Engram totaled 173.6 fantasy points last year, or the fourth-most by a rookie tight end ever. Tight ends typically make a massive leap in their sophomore seasons, but I’m not as bullish on Engram. He saw tremendous volume (ranking third in expected fantasy points per game) but averaged 1.1 fewer fantasy points per game than expected, which ranked fourth-worst of 33 qualifying tight ends. Engram landed in an ideal situation last year, with Odell Beckham Jr., Sterling Shepard, and Brandon Marshall combining to miss a whopping 28 games. It’s unlikely his volume is anywhere as good next year with Beckham returning, and especially so after the team spent their No. 2-overall draft pick on running back Saquon Barkley. Engram is an easy fade at his current price-tag (sixth-round ADP, TE6). You might not have guessed it, but Walker actually leads all tight ends in expected fantasy points per game (12.6) over the past three seasons. In each of the past four seasons, he’s led the receivers on his team and has averaged at least 11.5 expected fantasy points per game. He’s also finished sixth, sixth, third, and seventh in actual fantasy points per game over this stretch. Although Corey Davis may soon supplant him as the top passing-game option, it feels as though that’s already baked in to Walker’s current ADP (TE8). Tennessee’s new offense is unlikely to be as slow-paced and run-heavy as last year (they ranked fourth-lowest in passing plays per game), the passing game is due for some positive regression, and Tennessee has our third-easiest tight end schedule next year. All of this makes a compelling case for Walker as one of the safest picks at the position. Rudolph ranked second in expected fantasy points per game in 2016 but took a major step back last year, ranking 12th (8.6). In total, he saw 1.75 fewer expected touchdowns and 2.75 fewer targets per game than he did in 2016. However, he did suffer an ankle injury in Week 14 that lingered until the playoffs. If we exclude all games after Week 14, he would have ranked eighth-best in expected fantasy points per game (9.8). He’s not a terrible pick at ADP (TE7) but is likely a tad overpriced with the return of a healthy Dalvin Cook (Rudolph averaged just 6.2 expected fantasy points per game prior to Cook’s Week 5 injury) and following the emergence of Adam Thielen as a dependable No. 2 option in the passing game. Seferian-Jenkins has gotten some buzz this offseason, and he ranked highly in expected fantasy points last year, but he was also woefully inefficient. He graded out 43rd of 55 qualifying tight ends as a receiver last year. He drew 74 targets and averaged just 4.83 yards per target, which was the 16th-lowest rate of 581 qualifying tight ends since targets became a stat (1992). In terms of expected fantasy points, only Olsen (fractured foot) and Stephen Anderson were less efficient than his -1.2 differential. Luckily, his ADP is low enough (TE16) that he’s still a decent value. Since 2016, Clay has missed four games and spent a whopping 17 weeks on the injury report listed as questionable. In spite of this, he ranks 12th in both expected and actual fantasy points over the past two seasons. He finished eighth in expected fantasy points per game and 12th in actual fantasy points per game last year – well above his current ADP (TE21). Despite being saddled with an inexperienced quarterback this season (whichever inexperienced quarterback it may be), Clay is still one of the strongest best-ball values at the position.